Sekiro is a challenging game, to say the least, and can at times feel completely insurmountable. Luckily there is a method to most of this game and with this Sekiro: Shadows Die Twice beginner’s guide, you will hopefully have an easier go at it. In Sekiro, the main goal when fighting enemies is not to damage their health but their posture meter instead. While hitting them with attacks will damage posture as well, the most effective way is to deflect and counter incoming attacks. You do this by blocking attacks at the very last moment; be early and you take posture damage, be late and you take health damage. Once posture is broken, enemies are open to a Deathblow that will kill anything but bosses. To make things more complicated, deflections are not a riposte from Dark Souls and just deflecting one attack will usually not be enough to break posture. Instead, you need to anticipate and deflect multiple attacks in succession to beat an enemy effectively. It is very fast and intense in a way that few games can come close to. My advice is to use the early undying samurai you face to get the flow of the combat down; see them as fighting game duels rather than just mobs in an RPG. This is because you will quickly encounter enemies who are far less susceptible to being rushed or cheesed. Defeating samurai and monsters in Sekiro gives you XP that eventually accumulate into Skill Points, which you can then use to unlock different attack or latent skills. Attack skills are new movements and latent skills often help you with managing your health or stealth. One early skill you can unlock which is essential for the rest of the game is the Mikiri Counter. This skill grants you the ability to counter deadly thrusting attacks by pinning them to the ground. Early on you will encounter a miniboss called The Shinobi Hunter who is essentially unbeatable without mastery of this skill. To initiate the Mikiri Counter, you need to dodge into an oncoming thrust attack. It is a bit counter-intuitive at first, but keep practicing it and it will be that much easier once you get to the middle and late game enemies. The first rule of fighting groups of enemies in Sekiro is: Don’t. The AI is very aggressive and enemies will not stand in a ring around you and attack one by one like in the Batman games. No, facing multiple enemies at once will quickly turn into a swift death for our shinobi. It is far better to simply run away to get back into stealth or lure them to come at you one by one. If you get cornered and cannot run away or slip into stealth again; go for the weakest and ranged enemies first. This is because you want to whittle down their numbers as quickly as possible in order to not having to deal with getting interrupted by incoming bullets or attacks when you cut down the bigger enemies. A big difference between this game and previous FromSoftware games is that stealth plays a significant role in the gameplay. You are a Shinobi after all. Stealth is the single most important thing to master when dealing with groups of enemies. Even if you manage to kill off just one or two enemies before they get alerted, it could save the day. What’s more, stealth works on most enemies, including minibosses. Being able to effectively cut a boss’s health in half before the fight even starts goes a long way towards ensuring victory. As you play, you will unlock more skills which makes it easier to get back into stealth. Initially, though, it is good to use the grappling hook and tall grass to break line of sight if you get caught sneaking around. Once enemies settle down again you can sneak back and backstab a few more. Sekiro proves this point in an early scenario at the Hirata Estate. There you will eventually face a humongous enemy called Jouzu the Drunkard. Jouzu is surrounded by several groups of bodyguards and the key to success in this fight is to stealth around and backstab as many people as possible before you take on the big boy himself. Many enemies and especially bosses will regain posture very quickly if you let them. Again, this is not a Dark Souls game so playing passively will likely not get you far. You should not really back away from a one on one fight other than to avoid damage or go and heal up. This is because as soon as you back away, the posture damage you dealt will start to go away. Of course, this does not mean that you can be reckless when you fight enemies. You still need to learn an enemy’s attacks and be able to back off and spring forward at the right moment, but you shouldn’t expect any breaks in a fight until one of you lies dead on the ground. Think of the combat as it is depicted in old samurai movies. Lots of back and forth, blocking evading, and attacking but never really backing away from your opponent until that swift deathblow comes. 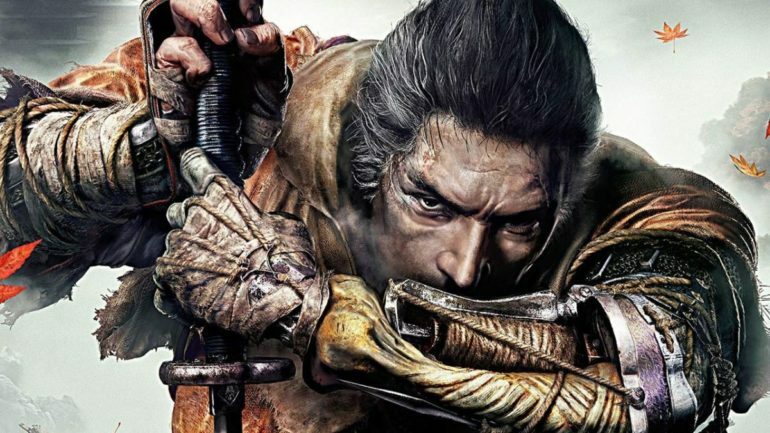 Sekiro can jump and make use of a grappling hook to get around, but these tools are not just meant to be used for platforming and traversal, however. Making good use of the extra mobility you have is key to many of the toughest battles in Sekiro. The first time you are likely to feel this is when fighting the Chained Ogre. He is a giant of a man stuck to a wooden fence, with big glowing eyes. The chained Ogre fight takes place in an area filled with grappling points and his attacks are generally unblockable grabs. These types of enemies require you to dodge and grapple your way around or above them in order to do effective damage. Many of the bigger foes also let you grapple onto them to deal with some powerful blows. You have a nifty little prosthetic arm which can be outfitted with various tools, use it and use it well. Throughout the game, you will come across different tools which can be fitted to your prosthetic arm, making it even more versatile and useful. Whenever you feel you are banging your head against a wall and don’t know what to do, it might be time to check what effect the different prosthetic tools have. One early essential tool is the loaded axe, which destroys shields and can do a lot of posture damage if you manage to time it right. The prosthetics you have equipped can also be changed on the fly so don’t feel afraid of experimenting. The prosthetic tools use a resource called spirit emblems, but they are cheap and easy to acquire when you rest so don’t hesitate to use that thing. Like with all Soulsborne games, you will inevitably end up smashing your skull against a brick wall again and again over a particular boss or enemy. Believe me when I say that walking away is probably your best bet here. Step away from the game and do something else, or just take a different route for a while. After clearing your head a bit, you will do a lot better — trust me. Personally, I find getting a palate cleanser in between sessions is the best way to go. Playing on the PC I had Hearts of Iron IV on in the background for just these occasions. There are few things that are more diametrically opposed as Sekiro and planning the logistics of an offensive through the Rhineland in Hearts of Iron. Point is, step away for a bit and come back with fresh eyes. Bosses in Sekiro are hard and you will likely die multiple times fighting them before you make any significant headway. Therefore, go in with the mindset that the first couple of deaths are just to warm up. Save your items and other consumables for when you think you have gotten the pattern down and think you have a chance. Probably the biggest issue many veterans of the Soulsborne games have is that they try to play Sekiro like FromsSoftware’s previous games. Don’t. Sekiro works in fundamentally different ways. Now, as you start out, things seem similar enough – there are things equivalent to estus flasks, bonfires and you level up from killing enemies. That said, the core gameplay is completely different. For one thing, you can’t keep improving your stats to overpower enemies that way. Skill points grant you access to new techniques and ways of using the tools you have at your disposal, but they do not increase your damage or health. To do that you need to beat bosses. So to a much higher degree than before, you simply need to learn how to play the game. Additionally, Dark Souls can be played in a very passive manner, you can hang back and basically turtle your way to victory in many cases. Sekiro demands that you actively participate in the entire fight in order to be successful. Take the early game’s lessons to heart and learn from the enemies you encounter and you will have a much easier go at it. You will die a lot in Sekiro as you have very limited health and few options for increasing it. Instead, Sekiro introduces resurrections. Basically, you have two lives — after all, shadows die twice. At full strength, you can resurrect twice before having to respawn back at a bonfire. However, you can’t use both resurrections in the same battle. Once you have used one life you need to kill a few enemies before you can resurrect again. Unlike Dark Souls and Bloodborne, you don’t drop souls and subsequently do not have to do corpse runs after you resurrect. Sekiro instead just cuts your accumulated XP and gold in half. It might seem harsh at first, but personally, I find it freeing to not have to nervously make my way back to the exact same spot where I died. Once you die, you are free to go somewhere else and see what a different path holds without the anchor of your corpse weighing you down. As you die in Sekiro, you will start getting things called Dragonrot. This makes NPCs in the world fall ill and start coughing up blood. Pretty nasty. What’s more, once an NPC is afflicted, he or she will not be able to give you hints or information and you cannot pick up or turn in quests while they are sick. Later on, you will gain some expensive means of purging Dragonrot from those afflicted. As you do this, don’t forget NPCs you have passed or been unable to interact with because they were sick before. Go back and talk to them again and they might ask a favor of you or offer you some vital piece of information. Like previous games, Sekiro has its share of secrets, not least of which is the secret shinobi doors. They are similar to the illusionary walls in Dark Souls. Unlike Dark Souls, however, they are not revealed by attacking. Instead, you need to get up on them and hug the wall. When you do this the wall will rotate, giving you access to the other side. They can be hard to spot on their own but I have found that they often have scrolls or pictures hanging on them. One early such door is in the manor house at Hirata Estate, just after you have murdered Juzou The Drunkard. A bit easier to spot are the secret items which hide on inaccessible ledges or behind walls. Keep an eye out for them and grappling points and you should be able to nab most of them without difficulty. Once in a while, you will encounter groups of enemies you can listen in on. Reaching the right position might be a bit tricky at times, but always do this. Quite often enemies will give you hints about how to defeat an upcoming boss or where some secret items are. It is well worth the effort in other words. Likewise, it can be a good idea to offer friendlies some booze or ‘tea’ if you have found any. This will make them tell stories about the world or give you hints about treasures and the like.